No Bad Days in Santa Cruz! While March Madness was in full swing in San Jose, I was just over the hill helping districts in Santa Cruz County learn more about the scope of all the information Escape Online stores in Employee Management, and the bounty of associated functionality. We held two days of training and I enjoyed meeting so many of users from Santa Cruz County and their districts alike. The first day I worked with the small and medium districts and finished up the second day working with the two large districts (Santa Cruz City Schools and Pajaro Valley USD). The first day of Employee Management training for districts in Santa Cruz COE. During our time together, we reviewed various ways to add, end, and delete records in Employee Management using the Mass Change Activity. We explored the benefits of creating good search and report criteria, creating Search Favorites, creating and saving Tab Filters, Employee Reports, Report Favorites, and Scheduling & Distributing Reports. We also discussed various ways in which data can be exported, and of course – utilizing the online documentation. But that’s not all! We also examined the employee’s Subject, Education, Evaluation, Seniority, Notes, and Attachment records. The second day of Employee Management training for districts in Santa Cruz COE. The day wouldn’t have been complete without sharing some ‘Pro-tips’ that users loved! Full disclosure, I also learned a ‘Pro-tip’ from their project lead Monica Beverly, Manager of Business Information Systems for Santa Cruz County Office of Education! I love learning from our Customers just as much as I love sharing my knowledge with them. Keep up the great work Santa Cruz Team! What Did Mendocino College Staff Say About Escape Online!? I had the pleasure of working closely with the HR/Payroll and Fiscal staff at Mendocino College during their implementation. With any implementation, challenges are expected, and it is fair to say the college had their share. However, their staff not only rose to the occasion, but worked closely and diligently throughout the project and successfully crossed the finish line. Fiscal Staff. 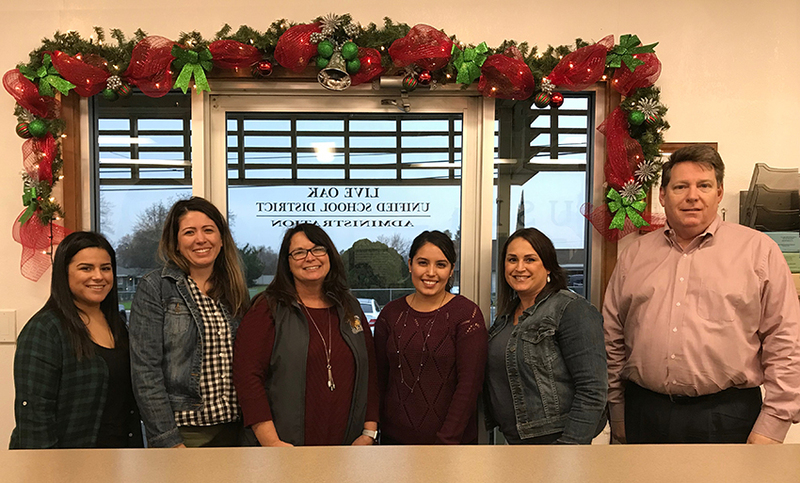 Pictured above left to right: Joe Atherton, Director of Fiscal Services; Patti Gulyas, Accounting Technician; Mayra Sanchez, Accounting Specialist; Eliza Fields, Accounting Specialist; Kaye Boswell, Budgets and Grants Technician. HR/Payroll Staff. Pictured above left to right: Lauren Simmonds, Accounting Specialist; Beatriz Sanchez, HR Technician; Cathleen Kucz, Accounting Specialist/Payroll; Janet Jones, HR Specialist. Implementation Working Session. Pictured above left to right: Mayra Sanchez, Accounting Specialist; Eliza Fields, Accounting Specialist; Jane Youngman, Escape Project Manager. I recently reached out to Joe Atherton, the Director of Fiscal Services, to see how things were going and he expressed how happy they are with the software. His staff was very excited about the features, so I was glad to hear the software is living up to their expectations. I asked Joe for a few reasons his users were loving the software, and in return I got far more than I asked for! 1. I no longer have to manually input 15 lines per page, 30 pages per month of P/T faculty payroll BECAUSE WE SIMPLY CONVERT A PAYROLL EXCEL (spreadsheet) TO A CSV FILE AND IMPORT IT! This function alone saves me, at the minimum, at least one full-day’s worth of work. 2. The Employee Management tabs are excellent and easy to access. 3. The pay stub generated by ESCAPE has actual DESCRIPTION LINES for the types of pay for which an employee is being compensated! This is especially important for the P/T faculty, who are generally paid for many different types of work, i.e., instructional, stipends, substitute work, flex, office hours, evaluations, etc. Before ESCAPE, I would be called up on to look up (quite frequently, each payroll) exactly WHAT such an employee was being paid for, as their stub only denoted a gross amount for the month, without any descriptions. The pay stub with ESCAPE is fantastic in regard to the information provided! 4. The Pay History function is easy-peasy, and a quick and accurate way to provide payroll information to an employee. 5. I no longer have to manually input the time sheets for our STNC and Student Workers. I simply create an EXCEL (spreadsheet) with their information, convert it to a CSV file, and import it into the system. Once again, valuable time is saved! 6. The payroll reports, specifically the Pay 14 (which is used to audit the monthly payroll), is easy to read and provides the information in a clear, concise fashion. I’m able to audit the payroll in a more timely, cohesive fashion. 7. The payroll errors report, the Pay 22, is an amazing feature! I can run this report and trouble-shoot errors prior to submitting the payroll to MCOE. Before ESCAPE, a payroll was submitted and the auditor at MCOE would be responsible for finding all the errors! Then the communication would begin back and forth to resolve the issues. Now, I can see the myriad of errors that can and do occur, and easily fix them before I submit the payroll. If I cannot fix an error, I obtain assistance. I can only imagine that the auditors at MCOE must love this feature as well, as it must save them valuable time each month! 8. Our longevity schedules are built-in to ESCAPE for F/T Classified and MSC, so we no longer have to manually keep track of longevity to make sure it increases at the appropriate time. I love hearing how much our customers love our software, and how much it helps them work with more efficiency, accuracy, and flexibility. I know as a former user, I couldn’t have lived without it, so I completely agree and relate to Cathi’s sentiments! I had the great pleasure of visiting Alameda Unified School District (AUSD) in January to provide training on Employee Management for their HR and Payroll departments. AUSD is the newest Alameda County district to join the Escape family and will be going live in July 2019! Picture Above: Participants in the training class at Alameda USD. We had a full day of training and hands-on practice with these new users, giving them tips on data entry, the multitude of ways to search for employees and the data we store for each of them. Doug D’Amour, Director, Financial Systems Support at ACOE (pictured standing in the back on left), was on hand to provide support and insight into the County’s processes as well. They all asked great questions and learned a lot. I can’t wait to continue on their journey with them in the coming months! Sutter County Superintendent of Schools (CSOS) is well on their way down the implementation path, with their July 1, 2019 “go live” date in their sights. There are high levels of participation at all training and working sessions, and CSOS-hosted working sessions. Both the CSOS and districts are really seeing the fruits of their labor. The CSOS staff have been a key element in assisting during trainings, as well as on-going support to the districts. The CSOS and Yuba City USD IT staff have also been instrumental in getting data out of their legacy software and providing it to Escape’s data expert, John Rhoadarmer, for import. This has had a tremendous positive impact on forward progress, not to mention freeing up their users from having to manually enter this information. Picture Above: A December pay compare working session for districts, CSOS Business Advisors and support staff. Before the winter break, I spent time with each district to answer questions, concerns, and to review the status of payroll compares. I was pleasantly surprised at how many districts had completed this daunting task or were close to completion! Pictured Above: Overview training session for the core team. I also had the pleasure of a couple on-site visits with Yuba City and Live Oak Unified School Districts. Both districts are diligently working on their HR/Payroll setup, doing a great job reviewing their data, asking questions and discussing the advantages of the functionality the software will afford them in the months to come. Pictured is the staff from Live Oak USD, from left to right: Erica Lopez, Accounting Technician; Sabrina Palmeri, Payroll Specialist; Margaret Cottman, Accounting Supervisor; Erika Arredondo, Student Support Specialist; Jane Youngman, Escape Project Manager; and Chris Peters, Chief Financial Officer. While the focus has been primarily HR/Payroll, we will soon be venturing into more Finance setup and training. As a matter of fact, both Sutter CSOS and Yuba City USD are currently working on 2019/20 Adopted Budget development in Escape! While I love the holidays, Budget is also one of my favorite times of the year. Keep up the great work, Team Sutter!